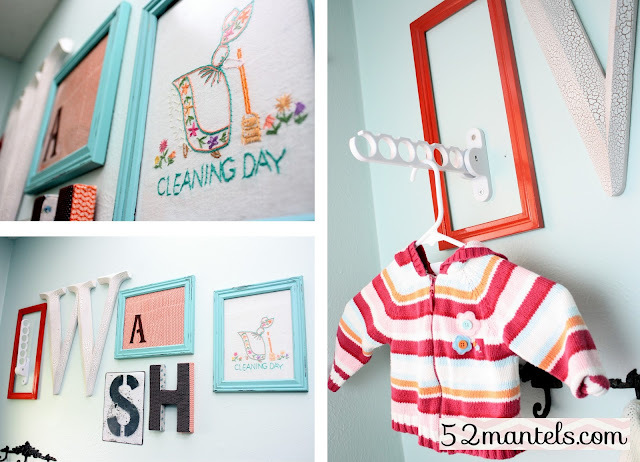 52 Mantels: Laundry Room Makeover! I can't believe the American Crafter FINAL round is HERE! It has been so much fun, but I'm excited that next week I'll get to focus on relaxing, hanging out with my sweet daughter...and, not having a deadline! In case you missed the announcement, my Porch Makeover (with reclaimed wood tabletop!) won the last round! Thanks for voting! For the final round, I decided to tackle my U-G-L-Y laundry room. And, do it for under $50. Tall order! 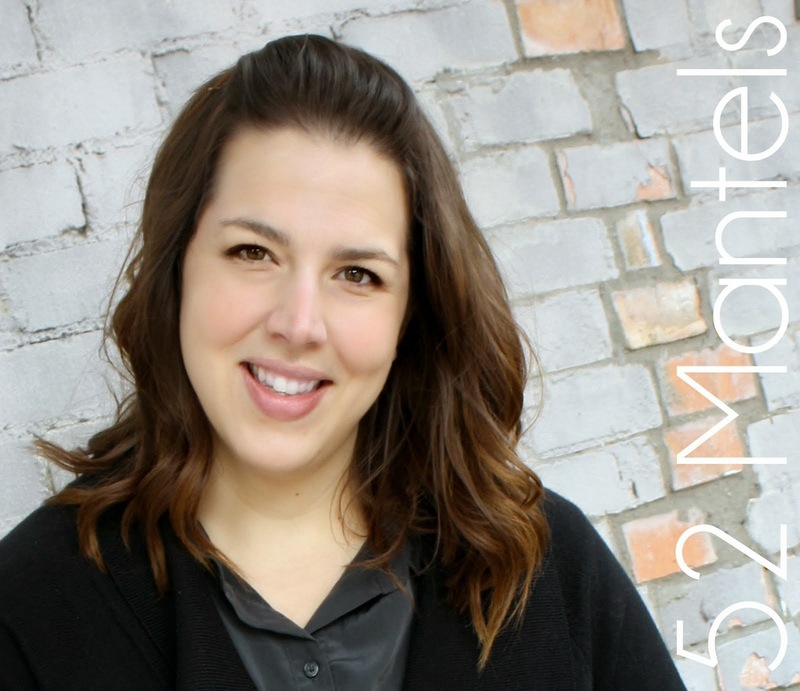 When we moved into our house, we didn't do a thing to our laundry room other than turn a small alcove into a broom closet and hide it all behind a brown curtain (that came with the house and once hung in the dining room- dreary! ).That room has been in serious need of a face-lift since! A laundry room is the perfect place to experiment with things you might be nervous to do in other rooms. 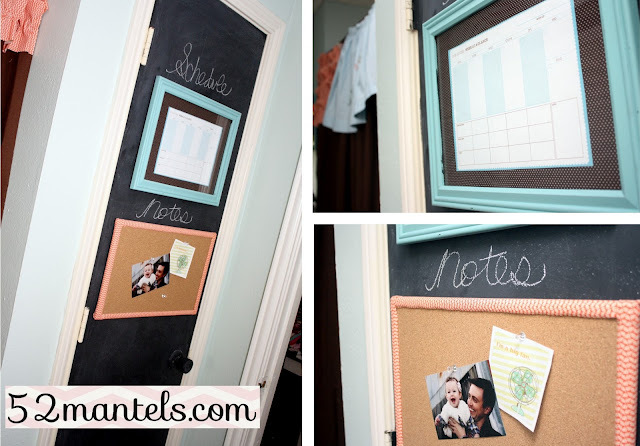 In this case, I've painted the cabinetry turquoise and painted an entire door with chalkboard paint! Throw in a fresh, lighter wall color and pops of orange and I've walked away with a fun place to do laundry! I'm guessing the cabinetry is original to the house, which was built in 1966. Yes, they're old cabinets. And, yes, they look like old cabinets. I knew I wouldn't be able to change them out and stick to my $50 budget. So, they got a paint job! Of course, I wanted to paint them a fun color. Turquoise! And, afterward, I sanded and glazed them to celebrate their age (no point in pretending they're young and fresh!). I also replaced the knobs with dollar bin knobs that spell out WASH. I love the way the cabinets turned out, but my favorite part of the room is the gallery wall! I bought the W a long time ago, thinking it was an M. It found a home on my mantel for awhile...until my hubby noticed and asked why I had an upside W on the mantel. I've saved that W because I knew one day I'd use it. And, I finally have! A- The black picture frames got painted with my turquoise paint. For the A, I placed fabric behind the glass and added an A cut from woodgrain contact paper. H- Anthropologie knock-off! I'll give the tutorial at another time! The Cleaning Day art is an antique embroidered hand towel that I've had for years. 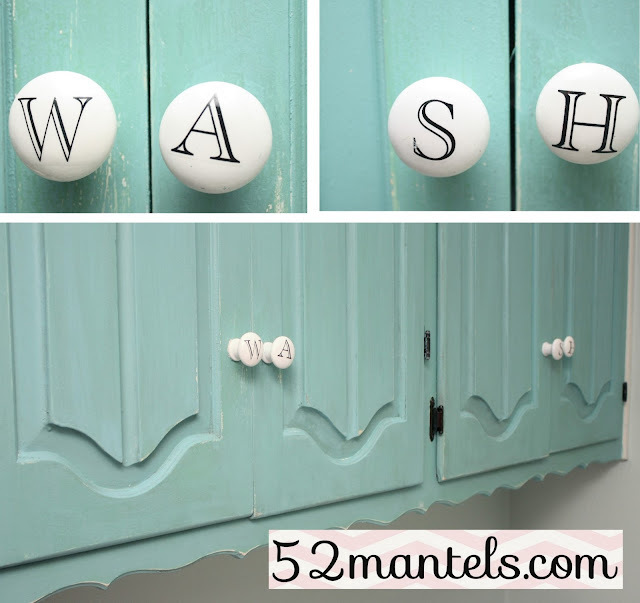 It seems fitting for the laundry room, don't you think? The last piece is all about function! I needed a place to hang various items as they came out of the washer or dryer and this plastic hanger holder works perfectly for that. But, it's not all that attractive. Solution? I took a frame from my stash, sprayed it orange and framed my hanger holder. And, that's how form meets function! One of my "must-have" elements for this makeover, was a message center! I knew I needed a calendar that I could write on and a place to pin various invitations that came in the mail. Plus, a chalkboard would be nice. So, I decided just to chalkboard paint the entire door! When my little one gets older, she'll have a blast coloring on the door as I fold laundry. I placed the calendar behind glass so I can use a dry-erase marker on it. I'll give a tutorial for the fabric-framed cork board soon! 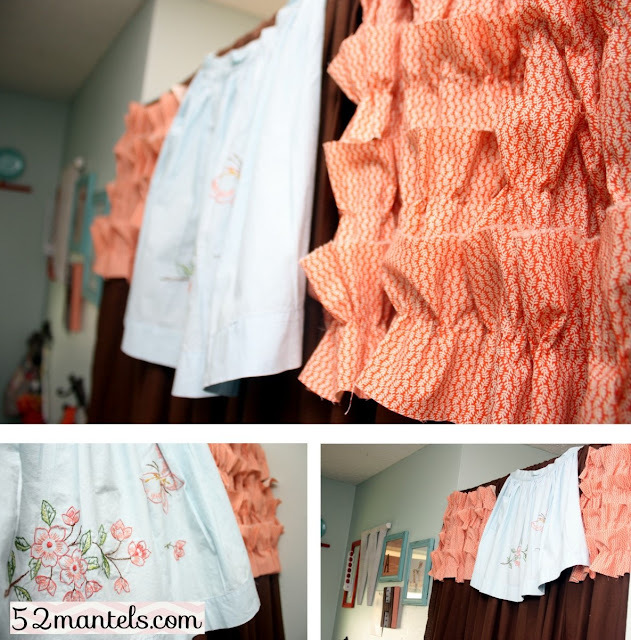 The brown curtains got a facelift with orange ruffles and an antique apron I've had for years! It was aqua and orange, so I knew it had to end up in the laundry room! And, that just about covers it! How'd I do on my budget? Here's the breakdown! **Updated to say that American Crafter is over and I am this season's winner!! What a fun competition! Yep! I link up here and here! it looks beautiful! i love the colors and love the painted cabinets! Great, great job!!! You're doing awesome on Am Crafter! I'll pulling for ya! I can't remember ....can we go and vote for you? Oh my gosh! I do love it! I really like the gallery wall especially! I'm off to vote for you now! AMAZING!!! You know you're my fav. Going to vote right now!!! Your laundry room is awesome! Seriously, I'm in love! Love the colour combo. I used the same in my kids' bathroom. Bright and cheery and uplifting in the morning (or when you are forced to do laundry!) Well done!! And to add to Lyndsey's comment, not only will it be less tedious, but extra trips may be made haha. So, my laundry room was on the list of possible final-projects...so glad I'm not up against yours :) Good luck! You did amazing work again, Emily! I cannot believe you only spent $51! So creative! I love everything about your new space! Love the color on the walls! And those knobs are so cute! Totally rooting for you! We're just ploughing through our laundry area now, it's grim. Of to vote C: would love if you came and shared at my party today. Wow, you did an amazing job! You have totally inspired me to go for it and re-do my laundry room. It is so small, but it could be such a sweeter place to get the cleaning done! ;-) Good luck!! I love your new laundry room! The "WASH" wall is so cute... I'm in love with that vintage embroidery and the colors in it are perfect! I think what would really finish it off would be a fun little rug in front of the washer and dryer! Love the WASH on the wall! The colors are fab!! Looks great, Emily! 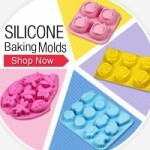 I voted for you on Nap Time Crafters! Hope you win! Well....that turned out so great! Was at Marcus' P.'s baby shower today and they have been voting for you. Woohoo! Time to win! i'm redo-ing my laundry area .. not a room like yours more like a closet haha - but i bought a similar color paint! perfect. 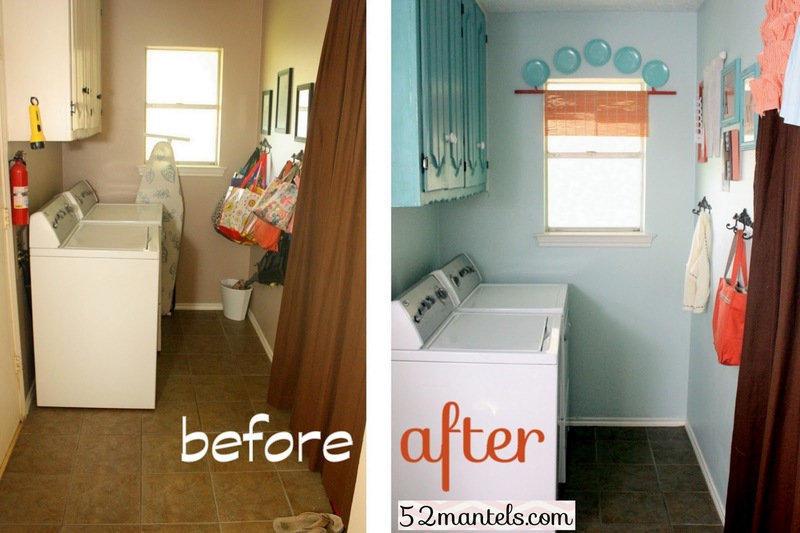 i love how your space turned out & the WASH on the wall is fabulous! Love it! I painted my laundry room a smurfish color blue & accented with bright colors. I it is one of my favorite areas of my house! What a nice job you did with your laundry room! Mine needs some desperate help-- it is turning into the place that all things without a proper place tend to go in our house...it's not pretty! I hope I can find motivation to work towards something like what you've created. Thanks! 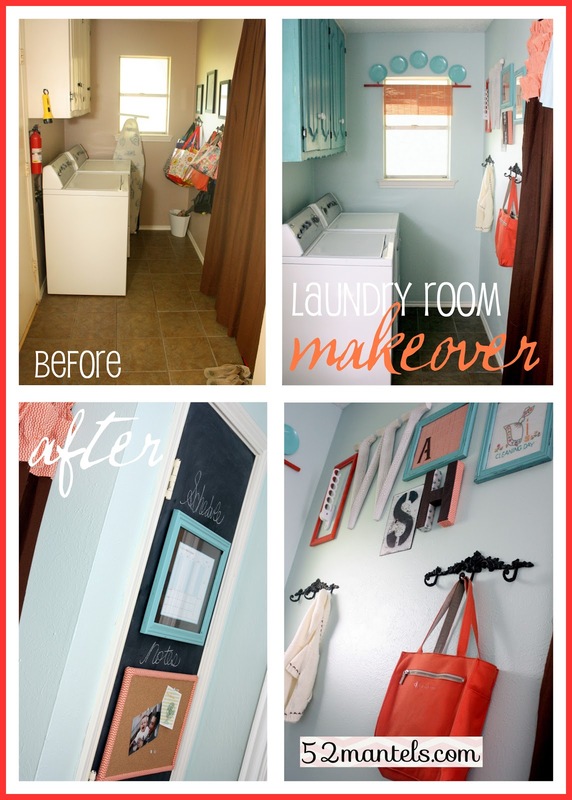 I missed the voting but I LOVE your laundry room redo! (I also love that it is about the same size as mine). Super practical but still a lot of fun. You have amazing style and talent! Want to link up to another party??? I hope so- I found you at 5 Days 5 Ways. Tonight I am hosting "Cowgirl Up" and it is a linked linky, share your post once and it appears on 4 awesome blogs. Hope you'll come party with us!! Wow That looks awesome. I hope it is ok if I pin this amazing room. This the first time I have come across your blog, I rely like it, I'm now following. I would be so happy if you had the time to stop by a and viisit me @ http://www.arosiesweethome.com/. I have a Link Party every Sunday if you would like to come share anything. I love those turquoise cupboards now. They turned out fabulous and I cannot believe that you got the new knobs for so cheap. They really sweet. I can hardly believe this is the same room. Thanks so much for sharing at our party this week. Great job, this looks awesome!! I love the aqua!! 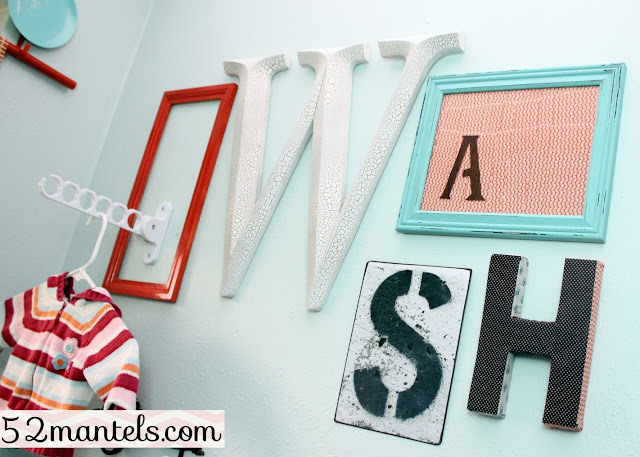 I love the frames and letters you used for wash. Also, the ruffles and apron added to the brown curtains look so good! I love this remodel. Thanks for sharing! That is SO cute! I bet doing laundry is a lot more fun now! I would love for you to share this (and any other creations) at my new linky party "Pin It and Win It Wednesday" @ www.cheapcraftymama.com! Love that gallery wall! 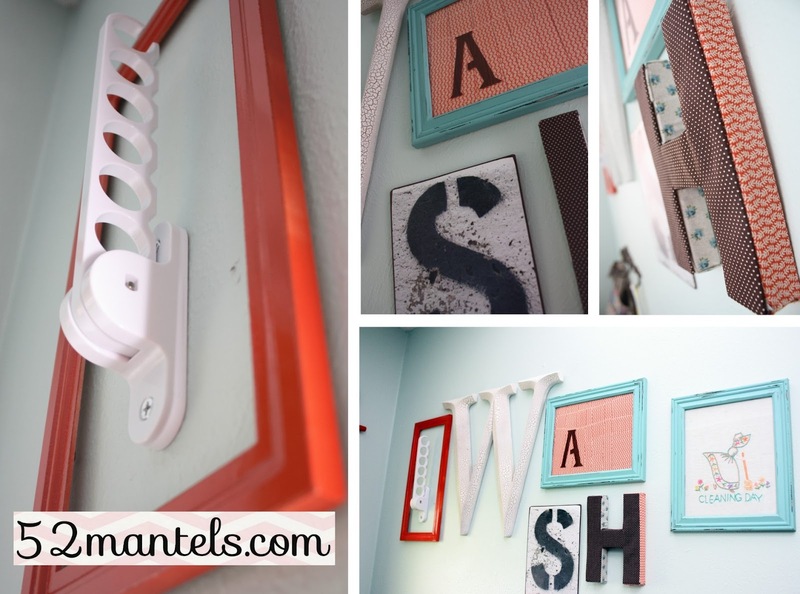 The W-A-S-H is great and I really love the hanger holder thingie with the frame around it! I adore this room! Amazing job! Umm...so I can't decide whether to feature this or you dining room. Both are so cool! I didn't mean to say "dining room" by the way (pregnant brain said, "There's a table in the pic...you should say dining room." PORCH (and that's the one I'm going with, I think. I love all the yellow!). This is not only a beautiful makeover, but you did it on a great budget and made it look really high end! I wish my laundry room looked half as good. This is fantastic!! love the colors! This is such a nice post which is about Laundry Room Makeover. I am very impressed by your efforts for this and this is very useful post for all of us. It's a huge difference!! Wow! !